We had a little change in plans this weekend. Originally we'd made plans to be in the mountains, but I was quite happy to be pointing the car down south instead on Saturday at noon and heading to my family's lakehouse. My parents were both so excited when we called them Friday night and asked if they had room for three more for the weekend! 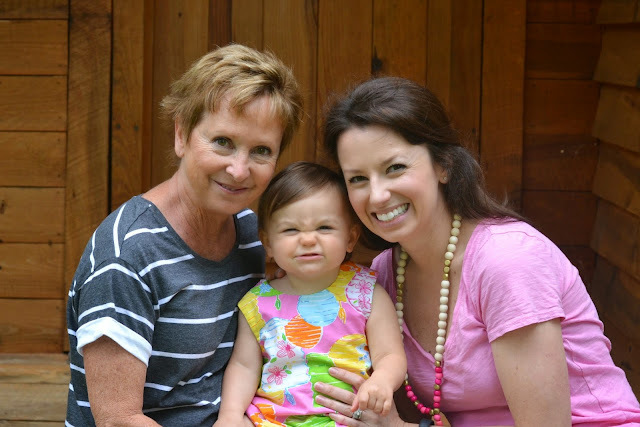 This was my first Mother's Day, and it was so special to be able to spend it with Camille AND with my own mom. Being a mother now myself has definitely changed my outlook in many ways, one great one being the way I view my own mother and everything she has done for me and my two sisters. I always knew that I wanted to be a mom. Once we were ready, our path to parenthood wasn't speedy-quick like I hoped it might be. Don't get me wrong, it also was nothing compared to what some friends have gone through. But I learned patience. Mother's Day does have a different meaning to me now. It makes me feel immense gratitude for what we do have, but it also pulls on my heartstrings when I think about friends or acquaintances of mine who have lost their mothers or who yearn to be a mother. I am afraid I am not really articulating this well, but suffice it to say I had a lot of women on my mind yesterday. Here are some photos we snapped after breakfast yesterday. My very first Mother's Day was most certainly worth the wait! Happy Mama's Day! You are a wonderful mama to Camille. And those pictures are so stinkin' cute. I think she is looking more and more like her Daddy! What wonderful pictures to remember your first Mother's Day! Very sweet! I share all of those feelings with you- the slight understanding of things not happening exactly when you want them to, the immense gratitude for my own sweet babe,and the prayers and hopes for those that don't have theirs yet. We have several close friends and family in that boat and I often feel a mixture of guilt and gratitude when I think of them. We're lucky ladies for sure! Great pics, love Camille's scrunched up nose face, too cute! Happy 1st Mother's Day friend! Love the scrunched nose face! Oh my goodness, I can't even handle the cuteness of Camille in the photo of the three of you! Love! Happy Mother's Day! Aww! How cute! I'm glad that you had such a great first mothers day! Happy Mother's Day! I feel you, our journey to parenthood wasn't hard, but it wasn't instant either. I feel like patience is the ultimate motherhood lesson. Happy Mother's Day! Oh my goodness, that one of Camille and you and your mom...her face is too cute! You are beautiful!! And Camille seriously gets cuter every day! So adorable! It sounds like you had a wonderful Mother's Day, and I thought your sentiments about motherhood were lovely. Glad you had a great first Mother' Day!!! You and C in your matching Lilly is perfection!!!! Thank you for your kind words and thinking about women like myself. I've struggled with Infertilty for 6 years with four miscarriages and I lost my mom a few years ago. Through adoption go have been able to celebrate Mother's Day the past two years and it makes my heart so full but I still feel the sting. I am so happy you got to spend yours with you mama and daughter, what a special day! I was wondering if you have started the process of weaning from breastfeeding now that C is almost a year old. My son is 9 months old and has been EBF the whole time. I pump when I am at work, but he only gets bottles when I am working. I have about a one month supply of frozen breastmilk. He is definitely more distracted while breastfeeding these days but my supply has not decreased at all. What are your plans on transitioning? Just curious! Love this! Happy Mother's Day to you!! Happy 1st Mother's Day! You and Camille are too adorable in your outfits! She's getting so big and happy 1st birthday to her tomorrow!